Qian Zhongshu (1910–98) was a famous modern Chinese writer, literary researcher and translator. 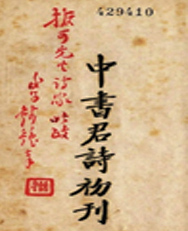 Qian’s first poetry anthology is Qian Zhongshu’s Poems. But this work was not printed, only handwritten and privately distributed. The First Printed Poems of Qian Zhongshu, published in 1934 and often referred to as his first poetry anthology, is actually his first printed poetry anthology. The First Printed Poems of Qian Zhongshu does not contain many poems and was originally printed only in small numbers. The content of these poems is not complicated. That’s because they were written when Qian had limited involvement with society. Therefore, most of them are about love or teachers and friends. In 1934, Qian went to his alma mater Tsinghua University to see his girlfriend Yang Jiang, and he also visited his teachers and friends. During that period, he wrote 22 qiyanjueju, four-line poems with seven characters to a line and a strict tonal pattern and rhyme scheme. He named these 22 poems “A Visit in Peking” and put them together with another 22 poems and merged them into The First Printed Poems of Qian Zhongshu. The poetry style of Qian in The First Printed Poems of Qian Zhongshu is totally different from that in his later works. When writing The First Printed Poems, he was good at writing with a beautiful style and gorgeous words. With his change of style and increase in age and knowledge, Qian was increasingly dissatisfied with his first printed poetry collection. “A Visit in Peking” is an important part of The First Printed Poems of Qian Zhongshu, from which we can see his experience in Peking (Beijing’s name at that time). The main purpose of Qian’s Peking visits was to date his girlfriend. However, at the beginning of “A Visit in Peking,” he still spends a lot of ink describing the hospitality of his teachers and friends. From “My dear teachers and friends are lining up to invite me to dinner,” we can feel how welcomed this gifted scholar is.